Field Sales | Lewis Associates, Inc.
Each selling environment is unique. As your product/service offering progresses through its natural cycle from early adapter to main street, your sales strategy needs to change. Should your sales group work the 80/20 rule, use a consultative style, or is a team selling approach more appropriate for your business? Identifying the right sales model and applying the right skill set will dramatically improve your sales team’s performance. In a sales conversation, the person who asks the questions has control. The best salespeople are invariable those who confidently and deliberately control the sales process, leading rather than following. The quality of the sales consultant's questions and his/her ability to ask them in a logical sequence is what demonstrates to the prospect that they are a complete professional. This program is designed for salespeople involved in business-to-business selling. Advanced Selling Skills teaches professional salespeople proven, practical concepts that they can use immediately to enhance their effectiveness and sales. 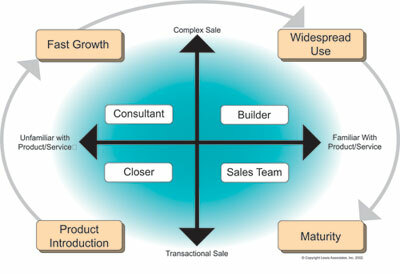 The course is based on actual sales experience in the field, utilizing a consultative sales model. The program synthesizes the very best work in research and methodology by sales professionals and consultants from the past 20 years, and provides a complete sales process to navigate the complex sale. A revolutionary breakthrough in applied selling technology, Behavioral Selling Skills is a learning system that helps sales professionals develop the flexibility needed to adapt their own behavior to their buyers' behavioral preferences. Based on practical, real-life examples, the program helps them sell the way their buyers want to buy, resulting in more productive, long-term client relationships. FASE was created to help sales professionals understand the business issues that drive buying decisions and decision-making behavior. During the workshop, the sales representative gains a strong understanding of accounting and finance. They learn how to use this information to evaluate a customer's potential needs and how to apply that to their sales effort. This course uses annual reports, corporate 10-K's and other SEC information to gain a strong financial understanding of the client and the competition. Your ability to negotiate well on your own behalf is essential to getting the very best prices, terms and deals that are available to you. By practicing the behaviors of top negotiators, you soon get the same results that they do. In this workshop, you learn how to approach every negotiating situation with a set of proven tools and techniques to get the very best deal for your company. “If we get in front of decision makers at the right companies, we win more than our fair share of new clients! If we could only get in front of more decision makers…" The New Business Development workshop is a complete process that helps you generate new business opportunities and sets them up so you are best positioned to win those opportunities. This program is designed to give the serious salesperson the guidance they need in learning and applying the rules of both the outer game of selling -- the key technical professional skills to make more sales; and the inner game of selling -- the mental laws that affect one's thought processes and thus significantly affect sales and income. Participants gain the specific skills and direction needed to become comfortable with their own presentation style, and they learn to feel comfortable before an audience. Each presentation delivered in class is recorded for review with the instructor and the presenter's peers. Sales reps receive feedback designed to meet their individual needs. Time is money – money for you, revenue for your company. And we all have the same amount of it. Same days in a month, hours in a day, and minutes in an hour for everyone. It just seems to work better for some than others. During this workshop we help you identify the important elements to consider when developing your sales time management system. Sales managers learn and begin to apply the critical skills and techniques necessary for managing and motivating a high performance sales force. This program gives your managers a series of key ideas, methods and techniques that they can use and implement to develop a superior sales team and achieve better results immediately. This program enables salespeople to "plan their work and work their plan". Each individual completes a strategic planning process as it applies to themselves personally and professionally, to their products and markets, to their territories and competition, and through to a complete blueprint for the entire sales period. Many organizations are considering a team selling strategy. Team selling is defined as when an individual usually charged with completing the sales transaction is now responsible for coordinating the efforts of a number of people all working towards the common sales goal. The team selling strategy requires the sales rep to perform in a non-traditional sales mode. Here the sales rep is responsible for assembling the appropriate personnel to gain access to the client, present, deliver and maintain the company's offering in a profitable fashion. Values are considered subjective and vary across people and organizations. Which makes it so difficult to sell really value based. Your charge is to determine the value set of your ideal client, create a customer experience that allows the client to identify their own value triggers and then return after installation to validate the real value inherent in your solution.